PARIS --- The revised military program law that is making its way through the French law-making process increases, for the first time in living memory, the multiyear spending blueprint known as Loi de Programmation Militaire, and adds 3.8 billion euros for 2016-2019. It also is the first time since the mid-1990s that French defense spending will increase year-on-year, and is all the more remarkable that it was decided by a Socialist government and approved by a Socialist parliamentary majority. Just as remarkably coming from a Socialist government, the increase is obtained by boosting the baseline budget, and replaces earlier gimmicks that were proving difficult to implement, such as the sale of military real estate and the auctioning off of military radio frequencies, or controversial, like the sale and lease-back of transport aircraft and frigates to private financing companies. Speaking in his capacity as chairman of the Defense Industries Council (CIDEF), Dassault Aviation Chairman Eric Trappier told Parliament’s defense committee May 29 that while industry welcomed the funding increase, French defense spending amounted to 1.47 percent of GDP, still well short of NATO’s 2% target. He also noted that it is still barely sufficient to fund ongoing programs and increased foreign operations, and warned that defense cannot be financed on credit. The funding increase is backed up by a strong increase in defense export sales, which are expected to reach 15 billion euros this year – more than triple the amount for 2012, when President François Hollande took office. This increase is largely due to the political support by Defense Minister Jean-Yves Le Drian, another Socialist, who has proved to be French defense industry’s most effective salesman in decades. In addition to the extra cash, balancing the books in 2016-2019 was made possible by deferring deliveries of Rafale combat aircraft to the cash-strapped French air force, and instead delivering them to export customers. This will offer some welcome relief to the service that must also pay for 12 Airbus MRTT tankers, as many A400M airlifters as Airbus Defence and Space can deliver, and additional NH90 helicopters and Reaper unmanned aerial vehicles. Rafale maker Dassault Aviation and its partners and subcontractors won’t suffer, either, as since February, Egypt has ordered 24 Rafales (€4.5 billion, along with a FREMM frigate), as did Qatar (€6.3 billion, with a very big weapon package), while negotiations with India (about €4-5 billion) for an additional 36 are now expected to lead to contract signature before the end of the year. Overall, France will spend €162.4 billion on defense between 2015 and 2019, of which €500 million have been earmarked for the reset of equipment used on foreign operations, in Africa and the Middle East. Another €1.5 billion will be spent on “critical equipment,” notably helicopters, tactical transport and intelligence. On average, €17.6 billion will go to defense procurement each year. A major change to previous plans is French President François Hollande’s decision to retain 18,750 military positions that were previously due to be cut, and to keep 7,000 soldiers on permanent standby for internal security missions. A large share of the additional funds approved by Hollande will be spent on equipment. 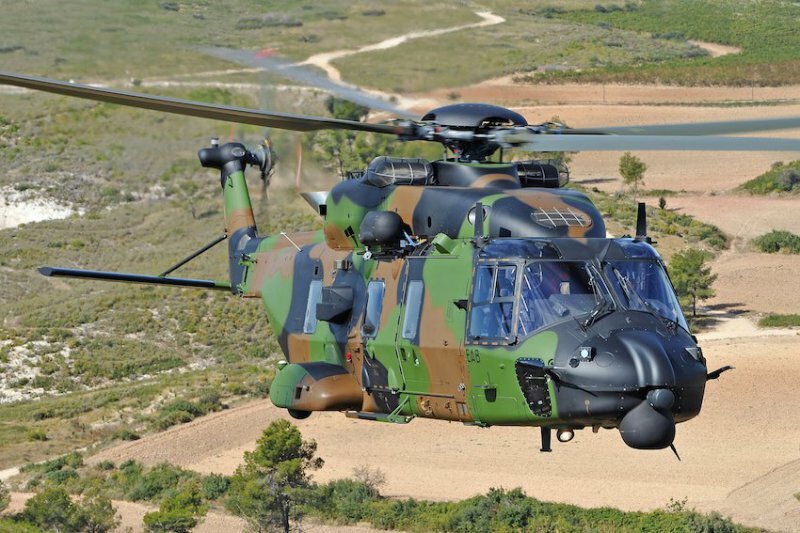 The Ministry of Defense has released a list that includes 7 Tiger combat helicopters and 6 NH90 tactical transport helicopters; a third MUSIS observation satellite to be bought jointly with Germany, and two C-130 transports to be specially modified and equipped for the Special Forces. The navy will benefit from the procurement of FTI intermediate-size frigates, the first of which will be delivered in 2023, as well as one additional Multi-Mission Vessel and of four BSAH support and assistance vessels. Also funded is the mid-life upgrade of the La Fayette-class stealth frigates, which will entail the fitting of a sonar. Delivery of the final 3 MRTT tanker aircraft will be brought forward, while the MoD also is looking at the feasibility of buying four C-130s, two of them equipped to refuel helicopters, which the A400M cannot do because of the turbulence caused by its large contra-rotating propellers. Also planned is the procurement of an ELINT payload for the Reaper UAVs, replacement of the night vision goggles used by Special Forces, and of 25 additional TALIOS pods for Mirage 2000D and Rafale combat aircraft. The army will concentrate its capabilities on special operations, airmobile combat, reconnaissance and ISR, cyberdefense and logistics, each with specialized units grouped in dedicated commands. France’s new model army will ultimately comprise 77,000 combat soldiers – 11,000 more than initially planned in 2013 – equipped with 200 Leclerc heavy tanks, 250 medium tanks, 2,700 multirole armored vehicles, 147 reconnaissance and attack helicopters, 115 transport helicopters, and about 30 SDI tactical drones. In December 2014, the defense ministry announced the award of a €752 million contract to launch Scorpion, the army’s ambitious modernization plan. This contract covers development and acquisition of 1,722 Griffon multi-role armored vehicles (VBMR); 248 Jaguar armored reconnaissance and combat vehicles (EBRC), and associated support and training systems. Delivery of the first VBMR is expected in 2018, with EBRC deliveries following shortly after 2019. Separately, on March 12, the defense ministry awarded a €330 million contract for the upgrade of 200 "Modernized Leclerc" main battle tanks and 18 "Modernized DCL" armored recovery vehicles for delivery from 2020. These will remain in service beyond 2040. By 2015, the French navy will operate ten nuclear-powered submarines, of which four ballistic missile boats and six Rubis- and Barracuda-class nuclear attack boats armed with the Missile de Croisière Naval naval cruise missile. The surface component, supported by three large logistic vessels, will comprise three Mistral-class BPC amphibious warfare ships, 15 first-rank frigates (FREMM, Horizon-class air-defense frigates and FTI intermediate-sized frigates), a mine warfare flotilla equipped with the SLAMF future minehunting system, and an aviation component operating 27 NH90 shipboard helicopters, 15 upgraded ATL-2 maritime patrol aircraft, and 40 Rafale Marine combat aircraft. In addition, six patrol frigates, four B2M multimission ships, 8 BSAH ocean-going support vessels – 4 of them leased – as well as smaller maritime patrol aircraft, light helicopters and BATSIMAR patrol and rescue ships will be deployed in France’s overseas territories and dependencies. In a May 29 speech at the naval aviation base at Lann-Bihoué, in Brittany, Le Drian provided additional details of the navy’s plans. He confirmed that a sixth FREMM anti-submarine frigate will be ordered to replace the one delivered to Egypt, and that all will be delivered by 2019, with another two – with enhanced air-defense capabilities -- to follow by 2022. They will be supported by five Frégates de Taille Intermédiaire (FTI, intermediate-sized frigates) whose deliveries will begin in 2023. These ships will be designed with an eye to the export market, and will support the larger FREMM class both operationally and on the international market, Le Drian said. To fly the flag in France’s widespread foreign territories, the Navy will buy a fourth Bâtiment Multi-Missions (B2M, or multi-mission vessel), the first of which is being built jointly by DCNS and the private Piriou shipyards. France also will buy two additional BSAH ocean-going support vessels, for a total of four, and will lease another four; the first is due to be delivered in 2017. The French air force’s strategic plan (‘Faire Face,” or Face Up) confirms its nuclear deterrent role as well as its dual mission of protecting national airspace and its approaches, and carrying out deep strike missions to protect national interests. By 2015, the air force will operate 185 modern combat aircraft, about 50 tactical transport aircraft, four AWACS, 12 MRTT multi-role tankers, 12 theater-level surveillance drones, light and medium transport helicopters, light, fixed-wing ISR aircraft, and 8 medium-range air-defense systems. In the short term the priority is intelligence, with the procurement of an electronic intelligence (ELINT) payload for the Reaper UAVs. The second priority is to avoid any shortfall in tactical transport and in(flight refueling capabilities; this will require bringing forward to 2025 the final delivery of the 12 tankers, while the acquisition of four additional C-130s is likely to make up for the wearing out of the C160 Transall fleet. The acquisition of new laser designation pods will replace those that are being heavily used on operations.